'Clúdaíonn an suíomh luath-Chríostaíochta agus meánaoiseach ag Cill Maoilchéadair achar mór ... Cé go ndeirtear gurbh é Maolcethair a bhunaigh é sa seachtú haois, tá baint ag Naomh Breandán leis an suíomh. Is dócha gur tógadh an séipéal i lár an dara haoise déag agus bhí sé tábhachtach i rith na tréimhse meánaoisí. Áirítear le fothaí reatha ón tréimhse luath-Chríostaíochta foirgneamh coirbéalta, b’fhéidir cill, 50 m ón séipéal, cloch ogham, cloch an chloig ghréine (3D PDF), cloch na haibítre (3D PDF), cros chloiche gan phátrún agus roinnt ballán. Tá aireagal Naomh Breandán ann freisin, suite 400m ón séipéal. Áirítear le foirgnimh reatha a théann siar chomh fada leis an meánaois an séipéal Rómhánúil le roinnt dealbh ailtireachta breátha, Teach Naomh Breandán agus Teach an tSeansailéara. Tá dhá thobar chomh maith agus roinnt clocha le cros inscríofa orthu sa reilig' (Okasha and Forsyth 2001, 171). Tá poll in aice le barr na cloiche seo atá .12m domhain agus trastomhas .07m ar a mhéid aige (Cuppage 1986, 310). 'Smiotadh an inscríbhinn níos sine chun spás a dhéanamh don inscríbhinn reatha. Níl aon ní de seo fágtha ach an ANM ag an tús [nó b’fhéidir M agus Q de MAQI dá léifeá síos in ionad suas? ], ina bhfuil an leath H den M caillte. Tá an inscríbhinn in dhá líne (suas-síos) gearrtha seachas caite... Tá a ANM agus an chéad I éadrom: léiríonn an forfid an E.. Idir agus tar éis an NN deiridh tá spásanna fada, ach níl aon litriú iontu: cé go bhfuil eangaí gutaí meabhlacha le feiceáil ann' (Macalister 1945, 181). Deir Cuppage (1986, 310) nach léiríonn ach 4 eangach anois 'an AI in MAILE go bhfuil dóthain spáis ann chun slí a dhéanamh don phéire eile a thugtar le fios ar léamh AI'. Deimhníodh an léamh seo nuair a scrúdaíodh na sonraí 3D. Is ar éigin a fheictear an chéad AN den ANM. Níl aon dabht ach go ndéanann an inscríbhinn ' seo comóradh ar chléireach... Tá comhshonruithe Críostaí cinnte ag baint le Máel agus is searbhónta nó cliaint is ciall leis' (Moore 2010, 15). Léiríonn an chéad charachtar forlíontach (nó forfid) an E lena luach guthach /e/, seachas a luach consanta /k/ nó /x/, a thraslitrítear go hiondúil le K. Leis an úsáid guthach seo, 'is iondúil go bhfeictear gnéithe teangeolaíocha níos minice'. Tá 'comhghaol freisin leis an úsáid seo agus úsáid foirmle ANM, a thugann dáta deireanach' le fios chomh maith (McManus 1991, 79; Swift 1997, 83-90). Gnéithe deireanach eile (deireadh na séú haoise nó luath sa seachtú haois) den inscríbhinn ogham seo is ea MACI, le -I bréige a léiríonn 'buanseasmhacht an choinbhinsiúin ortagrafach den I deiridh a scríobh san fhocal foirmle' seo, agus IN*BIR sioncóipithe (McManus 1991, 80, 81, 90, 96). Rud atá suimiúil, má ghlacaimid leis na litreacha atá fágtha den inscríbhinn níos luaithe mar M agus Q, d’fhéadfadh samplaí a bheith againn den litriú níos luaithe (MAQI) agus níos déanaí (MACI) ar chloch ogham amháin. Is dócha go bhfuarthas ina shuíomh reatha é ag suíomh séipéil Chill Maoilchéadair i mbaile fearainn Chill Maoilchéadair agus barúntacht Chorca Dhuibhne. luaite don chéad uair, 1892 Allen, J.R. (Macalister 1945, 181). Cuppage, J. et al (1986): Archaeological Survey of the Dingle Peninsula. Baile an Fheirtéaraigh, lgh 308-23. Macalister, R.A.S. (1945): Corpus Inscriptionum Insularum Celticarum, lch 181. McManus, D. (1991): A guide to ogam. Maynooth Monographs 4, lgh 52, 66, 79, 80, 81, 90, 96. 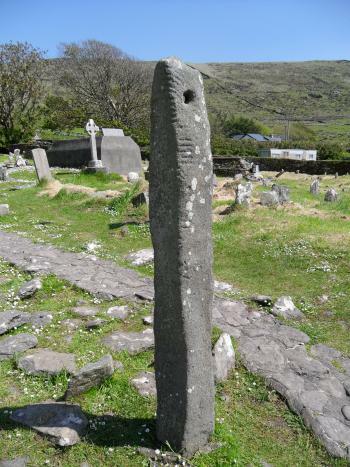 Moore, F. (2010): 'The Ogham Stones of County Kerry’ in Griffin Murray (eag. 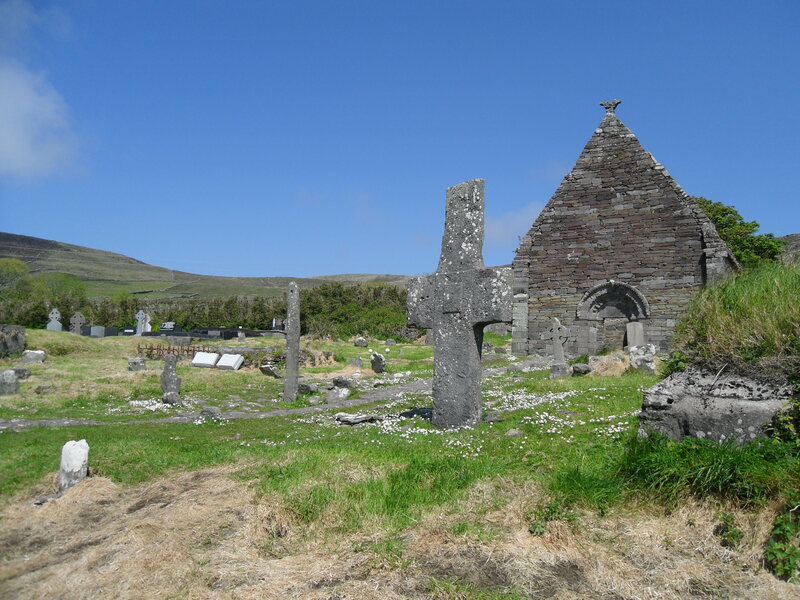 ), Medieval Treasures of County Kerry. Chiarraí, lgh 6-18. Okasha, E. agus Forsyth, K. (2001): Early Christian Inscriptions of Munster: A Corpus of the Inscribed Stones, lch 171. Swift, C. (1997): Ogam Stones and the Earliest Irish Christians. Maigh Nuad, lgh 83-90.